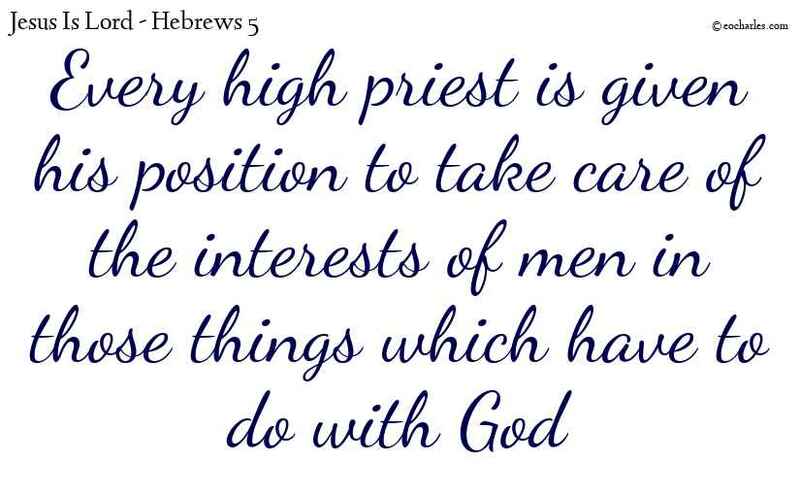 Every high priest who is taken from among men is given his position to take care of the interests of men in those things which have to do with God, so that he may make offerings for sins. Take up God’s instruments of war, so that you may be able to keep your position against all the deceits of the Evil One. For our fight is not against flesh and blood, but against authorities and powers, against the world-rulers of this dark night, against the spirits of evil in the heavens. 1)Eph 6:13 For this reason take up all the arms of God, so that you may be able to be strong in the evil day, and, having done all, to keep your place. Eph 6:16 And most of all, using faith as a cover to keep off all the flaming arrows of the Evil One. Eph 6:20 For which I am a representative in chains, and that I may say without fear the things which it is right for me to say. 1. 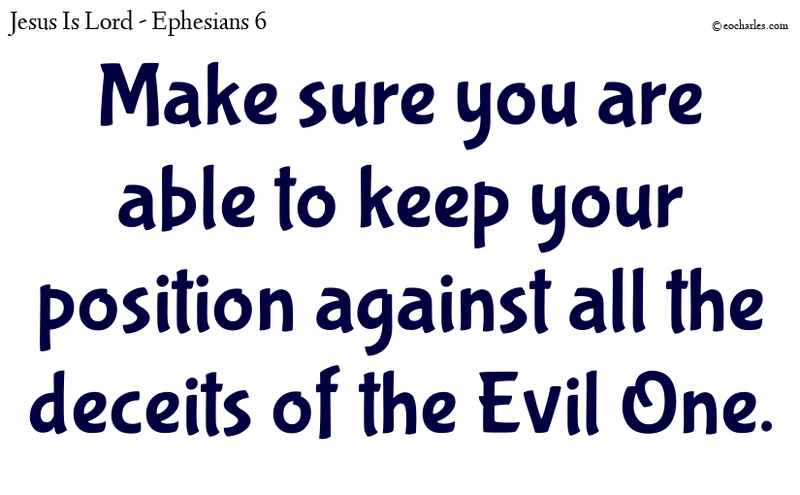 ↑ Eph 6:13 For this reason take up all the arms of God, so that you may be able to be strong in the evil day, and, having done all, to keep your place. Set your heart on God’s work as Solomon did. 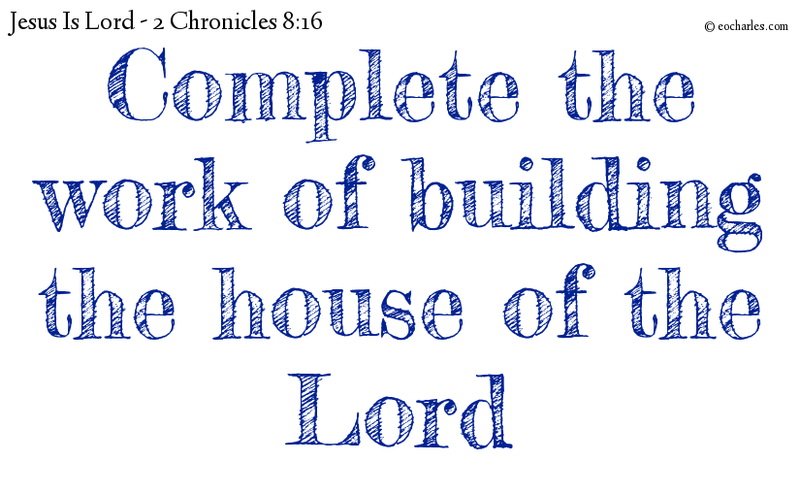 And all the work of Solomon was complete, from the day when he put the base of the Lord’s house in position, till Solomon had come to the end of building the Lord’s house. So they were put into their different groups, to take their places in the house of the Lord, in agreement with the rules made by Aaron their father, as the Lord, the God of Israel, had given him orders. Rom 12:8 He who has the power of comforting, let him do so; he who gives, let him give freely; he who has the power of ruling, let him do it with a serious mind; he who has mercy on others, let it be with joy. 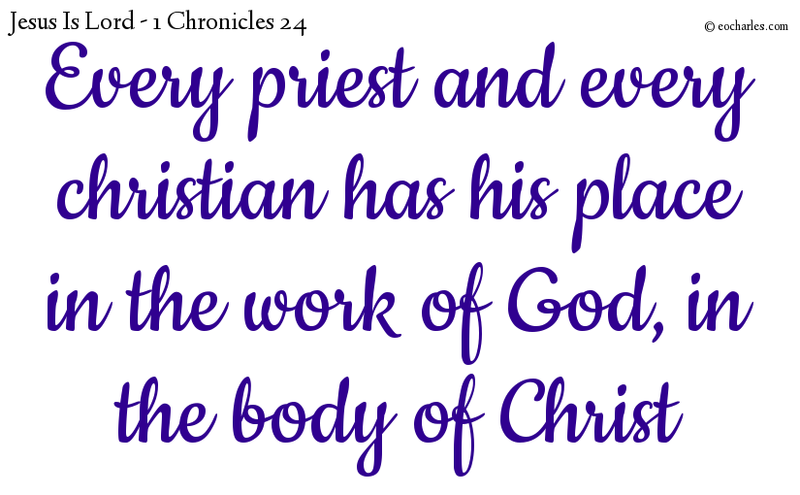 <fn>1Co 12:12 For as the body is one, and has a number of parts, and all the parts make one body, so is Christ. Rom 12:8 He who has the power of comforting, let him do so; he who gives, let him give freely; he who has the power of ruling, let him do it with a serious mind; he who has mercy on others, let it be with joy.